Stitching Dreams: Chicks and Bunnies and Eggs... Oh, my! Chicks and Bunnies and Eggs... Oh, my! Whew! I made it! Once again, I'm down to the wire in trying to squeeze in two posts each month. In a few short hours it will be April, but at this very minute--it is still March! So, how have you been during this changeable month? I'm still (believe it or not) dealing with a bit of a cough which is hanging on from my bout with the flu. Nothing terrible--just annoying. Hopefully, in another week, it will be gone for good. It was a busy month for me with trips to both Florida (which you read about in my last post) and to New York to visit my mom last week (who is doing well, by the way--thank you to all of you who ask about her! She and I both really appreciate your kind thoughts!). I was able to finish up the bigger spring project that I told you about last time and I'm thrilled with how it turned out. This is a very old French chart called "Paques" (Easter) from Bleu de Chine in Paris. I've been trying to stitch some of these beauties from my stash rather than buying new things and I'm so happy to have this one stitched at last! I began stitching this with the suggested colors on natural linen, but didn't like the effect at all so I switched out all of the colors (except the greens) and stitched it on 40 ct. antique white linen. These changes gave it a brighter, springier look--much better! I wish my photos were better, but it has been four straight days of cloudy, gray weather (and even a bit of s-n-o-w this morning). Thank goodness I learned to make colonial knots as I am a complete failure (90% of the time!) at French knots--they always seem to pull through to the other side or look way too large. But, the colonial knots were much easier and fairly uniform in size. Just look at all of those little brown eyes I had to make for the chicks and bunnies! Click here for the video that I used for the colonial knots--it might be helpful to you, too. I love the yellow chicks running too and fro, some of them falling right over their large orange feet! As mentioned above, I changed most of the colors in this piece, but I especially wanted to change the one suggested for the bunnies. It was charted as DMC 919 which is an orange color. What? The bunnies who hop through my yard (nibbling at my flowers!) are brown so I used Classic Colorworks "Stepping Stones." for their fur. Much more lifelike, I think, don't you? Don't you love that gingham heart? After I was finished with the stitching, I pulled a frame from my Goodwill stash (which I had purchased for $1.99) and painted it white using three coats of Waverly Chalk pain in the "Plaster" color. I then distressed it with some fine-grade sand paper. I should have taken a "before" photo as it was a gold color and looked nothing like this. I'm so pleased with how it turned out with the green polka-dot fabric background and pale yellow ric-rak...The finished size including the frame is about 10" square. It makes a perfect addition to my Easter decor! Oldies, but goodies... I came across a couple of very old finishes all rolled up in a drawer last week and shared them with my stitching friends on Instagram. I was pleasantly surprised to find how much I still liked these even after all this time. I'm guessing I stitched them around 2002 or 2003 which is when I got back into stitching after a ten year hiatus. Who else has stitched one of these Told In a Garden Amish pieces? I chose to stitch these because of the colorful quilts, the beautiful homesteads and barns, and the depiction of a simpler, quieter way of life. They still call to me for those same reasons... I think I will try to frame them myself and get them out of hiding! Now, look at that Amish buggy above and just look at what passed in front of me (in the photo below) when I was visiting my mom in January! As you can see I took this from my car window--imagine riding in a buggy like this in the middle of winter... Brrrr!!! The horse and buggy were clip-clopping through the parking lot of a shopping area on a very frigid afternoon. There is a large Mennonite population up in that part of New York State (near the Finger Lakes) and many of them still use the horse and buggy method of transportation. I came across this very interesting article about how these buggies are built... If you'd like to read it, click here. They cost about $6800 to build according to the article--a lot less than a new car, that's for sure! More than enough Told In a Garden Charts to keep me stitching for years to come! How I Attach My Cording: On to a few tips that may help when you attach your cording. I've had several Instagram and blogging friends ask me about how I attach my cording so I came up with this little tutorial back in 2015 to help them. This is not how to make cording (but, here is a great video of a woman making it and using the exact method I use: cording video). In her video, Kathy only uses one length of DMC and doubles it over. I use three or four lengths of DMC and do not double it over. She and I both use the Kreinik Custom Corder, but you can make cording by using a drill, an electric mixer, or even a dowel or long pencil. There are a lot of YouTube videos on these various methods. I do highly suggest the Kreinik Corder, though--it is fun and easy! This is how I attach my cording--yes, I use glue so if you are anti-glue, there is no need to read any further. I have never had a problem with gluing on cording, buttons, bows, etc. in all the years I've been finishing. I use a teeny tiny bit applied on the end of a toothpick so it never oozes out. In my opinion, it gives a smoother look to a final finish than if it is sewn on. Just my opinion. However, I know there are some stitchers out there who would never allow glue to come in contact with their stitching so, if you are one of them, this method is not for you... You can click on all of the photos to enlarge them for more detailed views. Then you take the wound up, cut end and start gluing it to the top of the ornament. I use just a bit of Aleene's Tacky Glue on the end of a toothpick--go slowly. DO NOT glue the entire ornament at once! This is just the way I do it--I sort of made it up as I went along! I'm sure there are other ways of attaching cording that work, as well. This is simply what works best for me. I am not a professional finisher by any means! Most of the time the "meet-up" spot of the cording is covered by a bow or yo-yo or something, but there are times I just have the two ends meet up at the bottom like in this small pillow. I hope this has helped--even a little bit! I am not going to get into the habit of doing tutorials--there are so many wonderful ones out there already including those that Vonna does and also those by Pinwheel Ponders. This may just provide a few tips that might make it easier for you. Give it a try--cording does finish off ornaments and pillows in such a lovely way! But, you must be patient--good finishing takes a ton of time so do it on a day when you aren't feeling rushed or anxious. Cording Giveaway... Now, who would like to win some of my cording so you can get started embellishing your own pretty ornaments and pillows? 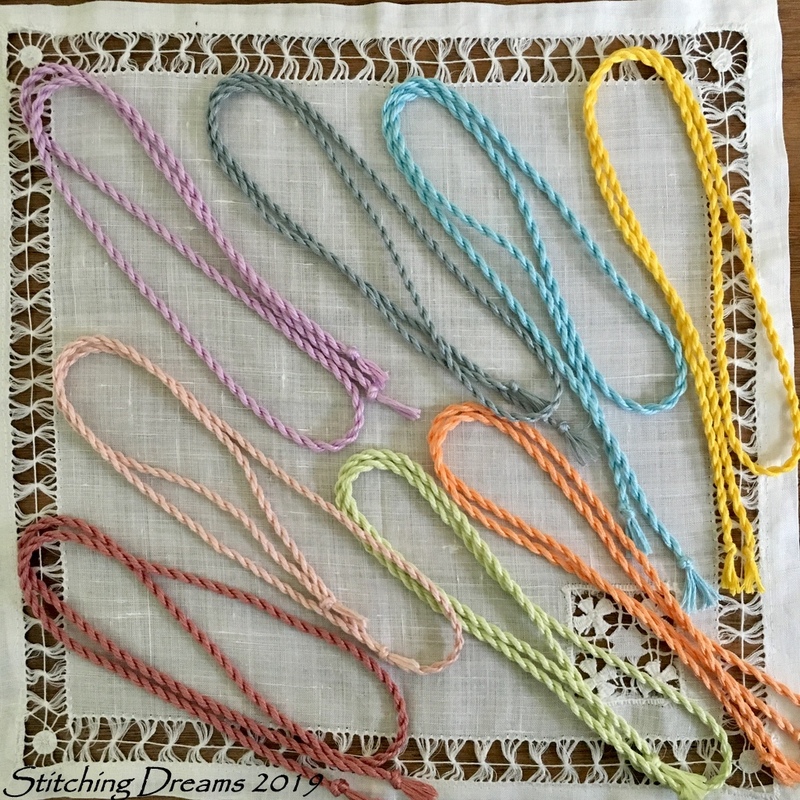 I've put together a little giveaway of eight pieces of cording in some pretty spring colors. All are at least 2 feet long... I used three 6 foot lengths of DMC to end up with the 2 feet of cording for four of them and four 6 foot lengths to end up with 2 feet of cording for the other four. It's a standoff... I'll leave you with this funny sight that I encountered while driving to get my hair cut a while back: a real stand-off between some giant turkeys and some even bigger cars... Traffic was stopped for quite a while in both directions as the turkeys did not want to be the first to move! I don't think the turkeys are very happy with me! 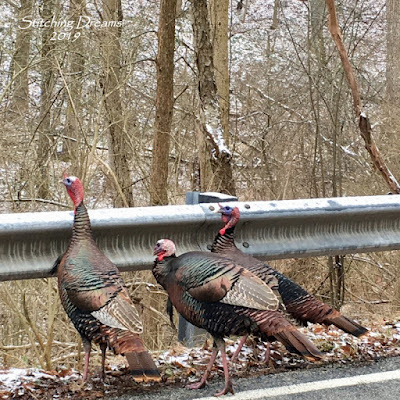 The turkeys finally conceded and the cars moved on--aren't they huge?! Such funny looking birds! What lovely stitches and finishes Carol. I really like Told in A Garden pieces. They remind me of my stitching favorites years ago!! My Brenda Gervais Bunny was my favorite spring stitch. I am about ready to start on my Patriotic pieces. I need to finish a few WIPs first!! What a generous giveaway...proably the only way I will ever have any cording.lol I keep meaning to try my hand at it but so far I have procrastinated. What wonderful and charming Easter subjects you've been stitching. I have a soft spot for that adorable rabbit in a little square of flowers and eggs under your WELCOME just under your header! So interesting to see how you make your cording. It does give a beautiful finish! Easter is late this year and I may try my hand at a few little Easter decorations! Wishing you a wonderful month of April! Paques is the perfect Easter design. How pretty! I like your use of fabric inside the frame behind Paques. I need to incorporate that into my finishing. Ah, cording! The bane of my existence! I should get back to practicing how to do cording. One day I'll get it but I'll check out the video you mentioned. I would love to give your cording a new home, Carol. What a fun giveaway! Bunny and Co by WTN & T is a favorite Easter-y finish, maybe 5 or 6 years ago. It was an exchange gift and I underestimated how much time I had to stitch it up! There I was at nearly midnight the day before I had to send it to my partner, still stitching, sewing it together. I ruched seam ribbon on it just like the model on the chart and that alone took some time. Fortunately, I got it and all the other stuff into the mail in time! It now lives in California. I just may look for her blog. I lost the picture of the finish and it has also disappeared off my blog. Good to hear your mother is well. Take care, Carol! (many Diane Graebner's). If it was me I would stitch any other Told In A Garden you choose to do on Aida, if only for consistency. Your work is always so beautiful. I wait each year to see your additions to your Christmas tree. Thanks for sharing your work. Actually I'm fine, but now and then I have the feeling of a cold and the next day everything is gone again. Oh, how beautiful the Easter Heart looks, all the little details. How cute the little chicks are. Great your finsih, it looks perfect. I've already seen it on Instagram and Blueberry Homecoming is my favorite, a very nice pattern. Thanks for the nice instructions, that's how I like it, and I learned something new. Oh how beautiful, I like to hop in your lottery-pot, so beautiful ornaments. So far I have not used any for an Easter decoration, but I would like to try a round version. Hi, well done Carol. The easterheart looks so lovely. I also have it in my basket together with the Christmasheart. But not yet stitched. Thanks for the tutorial. It will help and you are right, it needs time. As always your stitching is great. It's always a pleasure visiting your blog. Fantastic post Carol , love everything . Thank you for all the tips , love the cording . Your stitching is always amazing . I love your Amish stitching I have a couple of these but I have never seen the ones you have. Have a fab week and hope you feel better soon . Thank you for all you do, hugs. Do you make up cording for each individual ornament, or have you got a little stash already made up? Your Easter piece is so pretty, and those chicks! I also love the La D Da Bunny on your header, so much brighter than the cover pic. You have quite a collection of TIAG designs! I've always loved Blueberry Homecoming, I think it's her best design. Those quilts are so colorful! Thanks for the info on cording, yours is always so pretty. Those turkeys made me smile! Love all you stitching projects and thanks for the tutorial on finishing off. Thank you for sharing your cording tips! I have been wanting to email you to ask what tool you use, and now I and purchase one. Your finish work is exceptional. So glad to see you on Instagram with your Amish patterns and finishes. I saw someone else was showing 'Quilt Auction' from the same line. Maybe there will be a resurrection of these oldies but goodies! We have a lot of Amish in our area in Northwestern PA. Always fun to see them out and around. Beautiful work, Carol. I like the cording tied at the corner - very unique. your little Easter heart is so beautiful. The little chicken are very cute and the little bunnies are lovely. I like your finish. A wonderful Easter decoration. Your old two stitching are so beautiful. I like all your pattern. Thanks for sharing to cording on the little ornaments or pillows. I will try it. Please count me in to the giveaway. My favourite piecse are always my new pillows I have made. Hi, what lovely stiching and finishings. I love the heart of Bleu de Chine: soooo nice!! Such beautiful work you do!!! Thanks for the great tips!! The turkey story and pictures were a hoot.....made my day!!! Oh Carol, what a wonderful post. The spring heart is so pretty and the finish is great with the frame. I just need to be a fly on the wall in your home and watch you stitch and finish as you are one of my favorites in both. thanks for sharing as I have learned so much. I agree about those bunnies being brown and the turkeys were holding their ground for sure. I can't say enough thanks for the tips on the cording. The pictures help so much. I actually learn better from them and the written word better than the videos sometimes. Hope you get well soon. It is always a pleasure to see and read a new post from you, Carol. I love your beautiful Easter heart stitch. Well done and it looks great in the white frame on the polka dot background. Your TIAG pieces are gorgeous and timeless. I stitched one many years ago as a gift. I wonder where it is now. I hope you will pull one from the pile soon to stitch. Thank you for sharing how you apply cording! Enjoy this first week of April! Carol what a wonderful written post, so helpful. I love your told in a garden pieces they are a fun stitch and your Easter piece is so perfect, especially with your color changes and the finishing, you do such fantastic work and share with all of us. Can't wait to see what you do next. I have done some cording and it is time consuming like you said. Have a great Spring and Easter hope your family gets to visit with you. Thanks for a wonderful post. The Spring finishes are so delightful. Your instructions are very helpful and gave me some good ideas. Happy Spring to you. Your timing is perfect, Carol! I'm getting ready for my first attempt at attaching cording and your method looks like something I can do. Thank you so much! Oh my goodness, I just love that Bleu de Chine piece and the wonderful distressed frame sets it off beautifully. I love following your blog, your beautiful stitching, and your perfect finishes. I would be thrilled to get the cording. I haven't gotten up the nerve to try making my own. 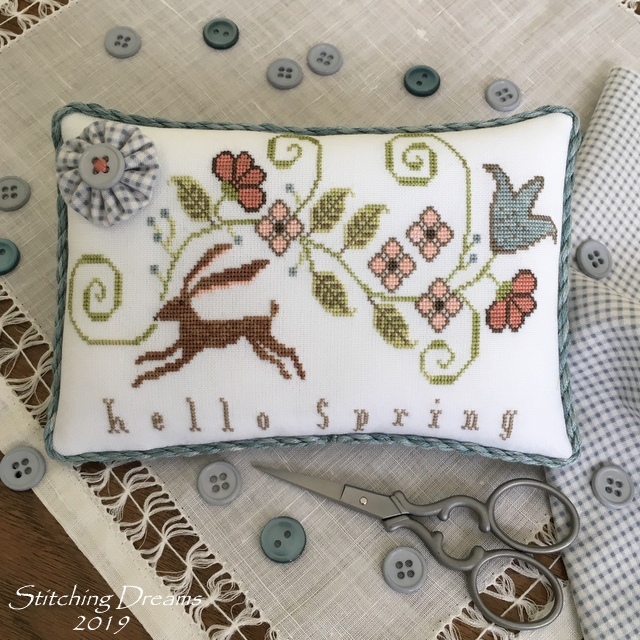 I am almost finished stitching Spring Has Sprung by CCN. I've made some minor color changes and think it will turn out really cute. I have a finishing idea already planned! So unlike me... Thank you for the generous offer. Love your Bleu de Chine "Paques". The little chicks are adorable. I have one of those corders and use it quite a bit. I can just never remember how many strands of DMC to use or how long to make it. I end up going by "trial & error". Thanks for your tutorial. I too use glue to attach cording but my problem is I can't seem to keep it straight. A spot will be closer to the back and another spot closer to the front. Really higgley-piggley. I haven't stitched an Easter project in a long time. I just remember it had bunnies in it. I would love to be entered into your draw for your cording. I always look forward to reading your blog and seeing your wonderful stitching and finishing. Lancaster County PA is my favorite place to visit although I haven't been since 2010. These days I don't travel for a variety of reasons. I do love the Told in a Garden pieces and have stitched many of the smalls, but only one larger one. Someday I'll stitch more of them. My late husband was born and raised in Penn Yan, NY where the Mennonites have purchased a lot of the land. I think my brother-in-law rents out some of his farmland to a Mennonite, but don't quote me on that. Such beautiful country in the Finger Lakes, only about 75 minutes from me. Have you ever been to Liberty Cottage in Canandaigua? I haven't, but have heard it's a great place. (libertycottage.com) Again, only 45 minutes from me. So many stores, so little time! I would like to enter your giveaway! Thanks for the chance. I haven't stitched up anything specific to Spring yet. I just got back into cross stitch about a year and a half ago. I am working on A Moment in Chalk by Hands on Design. I adore the old French pattern you finished, especially those little chicks running and falling across the heart. I also did "Welcome Spring" and finished it with sparkly lace and a bow I made with thin pink ribbon folded about six times so there are a lot of little pink ribbon ends trailing. It was nice to be stitching bunnies and flowers in the bitter New England cold of winter! Les Amish je trouve cette communauté fascinante. Même si je ne suis pas d'accord avec leurs façons de voir les choses. Bleu de Chine je crois bien qu'il n'existe plus mais ils ont laissés de très jolis modèles, comme celui que vous avez brodé et merveilleusement bien mis en valeur grâce à votre finition. Le point de noeud français m'a toujours causé des soucis comme pour vous. J'ai appris à faire le point colonial et je n'ai plus de soucis. Merci pour votre générosité d'offrir ces jolis cordons. C'est extrêmement gentil. I’m always so happy when your blog comes! I absolutely love the Paques heart. The little chicks are the cutest! I think the colors you chose are perfect. Thanks for the link on colonial knots. I’m going to check that out. My French knots are never uniform. Many times I just use beads. I also enjoyed seeing how you attach your cording. It really adds so much. Here in Minnesota we’ve finally lost most of our snow and some of the summer birds are returning. I’ve had a few turkeys in our yard this past week gobbling. I love seeing the males all fanned out. Thank you for offering the cording. I would love to try doing that. Have a happy spring and Easter. Thank you for another lovely blog newsletter. The Paques heart is so very sweet...and thank you for the enhanced image that lets us see the tiny details more closely. Your stitching is perfection. I have a favorite Easter time stitch and it's one you shared here on your blog some time ago...Slicker Bunny from The Cricket Collection. I struggle with making cording despite having watched quite a few videos. It all seems to go downhill near the end, when the cording seems to loosen when I remove it from the hook - despite pinching tightly. I wanted an eye-catching trim around the edge and found a video on ribbon braiding that turned out beautifully. My daughter has the bunny now, but I'm allowed visitation rights! Yes, please! I'd like to enter my name in the drawing for your cording gift. I just finished one rabbit piece with 2 rabbits sitting is some grass and each bunny had a heart on them--and right now I stitching a small chocolate rabbit and the details around him make him look like he is a design on an Easter egg- and I believe I am a follower--cause I have been reading you for years now!! Love seeing your Told In A Garden stitching. Those really take me back. Please enter me in the cord drawing. My favorite spring stitch is Spring Delivery from Plum Street Samplers. I've had those Told In A Garden charts on my wish list for a long time. The Easter design is gorgeous!!! and I want it now. You're such an enabler but I don't think that one is easy to find-at least not today on Ebay. I have one of those cording devices I bought about 20 years ago and I have yet to use it. I did watch Vonna's video and was going to try but I'm such a procrastinator when it comes to finishing. It's interesting to see all the different ways people finish. Have a great week. Thank you for sharing your finishing secrets, Carol! They are beyond my skill level but it is very kind of you to help those that are able! Your finishes are always of the highest quality so you are a natural source of info for anyone who wants to attempt a finish at home. I love your bunny thread color! I, too, always want to match my stitched animals to what i see in the yard so I love your changes. Those little chicks are just the cutest! I think 2 blog posts a month is ambitious and if it went to one you shouldnt feel guilty. It is time away from your actual craft! I am glad to hear that your mother is well but hope your nagging cough is gone asap! Happy April! Your Easter bunny and chicks stitch is adorable...so delicate! Really love it...and you finished it so well! And your Told in a Garden pieces are beautiful...the colors are spectacular! Thanks so much for directing us to the video and ask the cording info....so generous! Love the large Spring/Easter heart shaped design. The finish is just lovely. Liked the pictures of the turkeys. Always enjoy reading you blog. karleenm@msn.com Love the cording and thanks for the demo of how you attach it. I enjoyed seeing your Easter finishes. Thanks for showing how you finish with the cording. I really like the look but have not tried it yet. I am a follower and would like to be included in your giveaway. Thanks. The last Easter project I stitched was a little chick. What pretty brown bunnies. I think you did the right thing in changing the color. Very pretty projects. Thanks for the chance to win some cording. Cording adds a touch of elegance to projects. I’m working on Heartstring Samplery Spring Flame Pincushion as my spring project. It has been a WIP for quite awhile. I hope to finish it soon. Paques is beautiful! Congrats on such a great finish, it does look all ready for spring and Easter. Great tutorial too. I will have to give it a try and see how it goes. I would love to be included in your giveaway! Some of my favorite Easter pieces are Easter Eggs from Anna Waite Designs, Easter Bunny by Crafty Guild but my new favorite is Bunny in a Cup that I am currently stitching! Have a wonderful week and stay away from those turkeys! Hi Carol! Thank you so much for the cording tutorial. I have bought a winder but haven't used it yet and this is so helpful. Your Easter finish is fantastic and I love the colors you chose. Aren't turkeys funny! We have them on our property in Michigan and they love our creek and woods! Have a wonderful April; here's hoping the weather will improve. I would love to be entered in the cording giveaway. Thank you! I would love to enter and win you're cording. I'm just starting to begin finishing my pieces and would love to have it. So enjoy your blog. You're the one who got me interested in Smalls after a very long long break from cross stitching. Unfortunately I have no Easter completed project to talk about. But I surely enjoyed seeing yours. Congrats on the lovely finish Carol. Your Told in a Garden pieces are stunning. I have some of those charts but have never stitched one. I still say all of your finishes are stunning. I would love to be entered in your giveaway. Any of my Lizzie Kate monthlys would have to be favorite spring pieces. We have turkeys that come visit once in a while. Actually I think those birds are very pretty! I am so glad to hear your Mother is doing well! I so appreciate all your information. I glue on the trim also. I really make things for my enjoyment and if they are not looking good in fifty years, well I probably won't be either!! You have encouraged me to try to make cording. I will buy the drill you suggested and follow your directions. Thanks so much! I would love to enter your give away. I just finished Easter Peep by WTN&T. It is so cute. I also love my Easter Quaker. If I have to pick they are my favorites with the BBD bunny coming in very close!! Thank again for your wonderful advice! Your new Easter piece is beautiful!! The frame is also just great! I'm not stitching at the moment (I say, never wanting to rule it out! ), but I loved seeing how you do the cording on your ornaments! OMG, so clever! And the way you do it, the join is so seamless! I've always been terrible when it comes to finishing -- I always see the flaws in my finishing. Never could make my cording look so good. Wow. Thanks for the tutorial! You don't have to enter me in your giveaway, tempting as it is. The rate I'm going, I might never have a use for your beautiful cording and I don't want it wasted! Anyway, hope that cough goes away! I know what that's like -- when I get sick, somehow the cough takes forever to go away! Love your finish Carol .. It is so pretty! Those turkeys look huge! I just love your Easter Heart finish. I love the bright colors and can't imagine it duh and dark. Your version screams Spring and I love it. The frame is perfect of course. You must get tired of me loving your finishes but I just can't stop haha. Oh I'm glad you found those old pieces. Yes they must be framed so you can display them proudly. We have a lot of Amish around here so I'm used to seeing their buggies. I personally thing you should do the new Told in a Garden charts on the linen you love. It won't matter that they don't match the old ones just show how you have changed through the years. Thank you so very much for explaining your cording. Every little hint helps so much. I've been so lucky lately with giveaways I will stay out of this one. Good luck to all who have entered though. Love the turkeys. Too cute! Hope you have a fantastic April ahead. I just love your new Spring piece!! Amazing design and finish! I sometimes use glue on my cording too... The Kreinik custom corder is great, I also use another tool to make cording. Your tutorial is great! Lovely vintage pieces! !The blueberry piece is gorgeous!!! I make my own cording also, but I hand stitch it on. 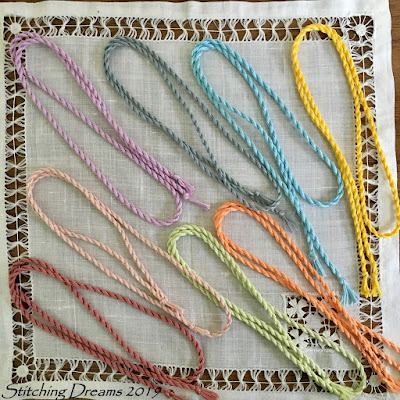 I have cording drills for sale on my stash blog if any of your readers are interested. Those turkeys ARE huge. Have you seen one fly? LOL We have them here, too. Once, I saw a couple fly from the ditch up in the trees. Spring is on it's way. Woo Hoo!! Those stitches are gorgeous. Hope I get 5e. Ording as I really want it! Loved the turkeys too. I've never tried gluing cording. I'm not sure why though! I'm going to give your method a try. I really appreciate your posting about it! Your bunnies looks the perfect colour on such a sweet finish. I've succumbed to the cough and cold that's about, its no fun! Happy Spring to you! It is always so lovely to read your blog posts. I so appreciate the time that you take to post your adventures (stitching or otherwise) and the stories that go with each one. Thanks for the tutorial on your cording. I am hoping to do more finishing this year of some ornaments that I have stitched. My goal is to copy your plan of stitch one/finish one! I am so happy that you will be framing your Told In A Garden pieces. They are beautiful! You have a lovely collection of their patterns. Some designs are just so timeless. I was laughing at your turkey picture! This is a fairly common occurance in our area as well. I am so happy you got to spend some time with your sister in Florida. It's great to hear that your mom is doing well and I'm glad the weather is getting nicer now for your drives to visit her. I have been thinking about my mom alot the past few days. Her birthday would be tomorrow. Wishing you a wonderful month with lots of sunshine and stitching! I completely forgot to say how beautiful your Easter ornament is!!! I love the changes you made and those little chicks are just too cute for words! You certainly look like a professional finisher. All of your things are lovely. I would be happy to take the cording off your hands. I'm stitching Bent Creek Easter Bunny Trail right now which I love. Thanks for all you do! Carol, your French Easter piece is beyond precious...it all came together perfectly...the design, your color changes and the frame! I have never tried the chalk paint, but it certainly looks very professional! All your spring pieces are lovely and I hope the weather gets more springy for you soon! I think I had all those TIAG charts at one time and never stitched a one...they were given away years ago but I still love the look of them! Hi Carol! I really love your Easter heart - the colors and the framing are just perfect! I also really like your Amish pieces - I have one in my stash to do someday! It never seems to come to the top, but I still like it! Thanks for the cording tutorial - I’ve only used it a few times and didn’t quite know how to end it off. I have some to make and attach to an ornament so this will really come in handy! I also wonder if you have any tips on how to shop for frames at goodwill - do you look for certain sizes or finishes? I don’t really have any “inventory” but it might be fun to build some! I’d love to win the cording - I think my favorite Easter stitch is a bunny I did years and years ago- the whole tail is French knots and my mom had to do them for me because I couldn’t figure them out for the longest time! She also got it framed for me and it’s is super cute - I’ll have to take a picture and share on Instagram! Hope you’re having a good week and getting rid of the pesky cough! Carol, I love your Paques stitch and the finish could not be more perfect. Don't you just love chalk paint for updating old pieces? Thank you for your detailed tutorial on adding cording, I will come back to reference that as soon as I learn how to make the cording!! I must have 2 left hands because I have not grasped how to make it yet. I would love to enter your giveaway. Gosh, I have hardly stitched anything for Spring!! I think my favorite thing is the candle banner I stitched for our first blog post. 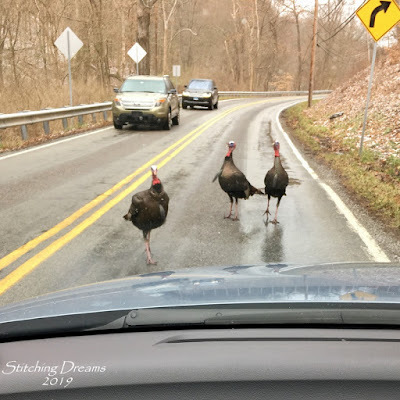 Love your turkey photos, did you see the video all over facebook of the big Tom Turkey holding up traffic so his flock could cross? Hope you have a great April, it's real slow getting warm weather here too. Thank you for this wonderful post, Carol, full of beautiful photos and helpful information. When writing about the Amish pieces, you said you had to decide whether to use Aida or linen. How DO you make that determination? Wow. That was a long way down to the end of comments! Thank you for sharing your cording method. And the colonial knot video. I always make knots the same way and assumed the two were interchangeable. Now I know how to do a colonial! Learned important tips today. Hope you completely recover soon! and again such a wonderful post, I love your embroidery and your sample collection too. Many thanks for all the great photos and for the tutorial, your blog is always an inspiration for me. Have a nice weekend, Jutta. Your Easter piece is adorable. Love the finishing, the green fabric and yellow ricrac compliment the design so well. Such a pretty design too. The Amish pieces are lovely. I think if you are going to hang them altogether then perhaps think about aida again. If not or you have no aida to hand go with linen. Thank you so much for the help with cording. I am going to master this yet!!! Carol, what a lovely post! Your stitching and finishing is just beautiful. It's one thing I suppose I should take the time to learn but I just am too busy stitching! Your finishes are so neat and the patterns in the post are really sweet. 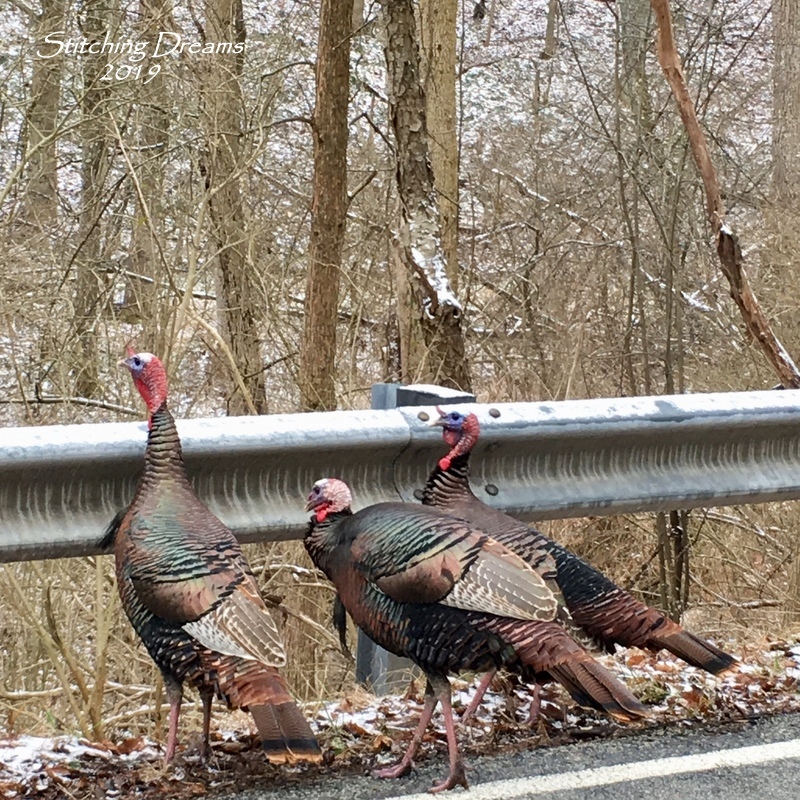 I also liked the photo of the Turkeys having a stand off with the traffic - so funny! Fantastic post and a great tutorial too. I love the changes you made to the Easter/Spring Heart, the colours look very fresh and Spring-like indeed. I had no idea I was a no-reply blogger. In my blog profile, I do get the right email address when you click through. I did go in and change one setting. Hopefully that will work! Please count me in for your cording drawing. I have tried to make some in the past but I think I just work too tightly in every crafting project EVER and they always look like disheveled noodles. I have very little Spring/Easter stitching (something I'm currently trying to remedy) but of what I do have, the Daffodil (surprise :b) huck towel from the Flower of the Month series. Stitched it in 2010, oh my... I really need to finish this series lol. Turkeys are just as stubborn as goats! I'd prefer a standoff over them flying in front of the vehicle; they do a remarkable amount of damage. I love your Easter heart and you make such nice choices when you change colors. I have a hard time doing that. When you are gluing the cording to a finished piece do you put the glue on the cording or piece? Fantastic pictures of the turkeys. I have seen them many times but never seen such pretty colors on them. Ours in Mi. look very drab in browns. 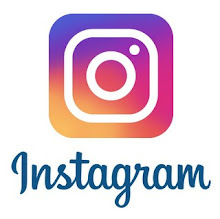 I enjoy reading your blog and am considering trying Instagram. Beautiful spring piece, such cute little chicks and sweet bunnies. I have a few Told In The Garden charts in my stash drawer. Your finished pieces make me want to stitch one! Thank you so much for the cording insructions. I never knew what to do with those thick knots, well now I do! I should have thought of that! Happy spring to you! Glad you're feeling better - the cough always seems to be the last to go, and it IS annoying. Hope it's gone by now. When my now-husband and I were dating in college and I was beginning cross stitch, I was so frustrated by written instructions for how to make French knots that I was pitching a FIT. (This was pre-internet!) He figured it out and taught me! Haha! This is the man who claims to have zero finger dexterity. But I still struggle sometimes with them pulling through to the back. If I come up in an adjacent thread (or split a thread on Aida) then go down in the hole where I want the knot, the knot does not pull through, and the knot hides the extra little bit of thread anchoring the knot. Wow - your Easter stitch is stunning. I wonder what the called-for colors would have looked like finished? Orange bunnies? Strange indeed. Your changes are perfect. And that frame turned out wonderfully. It looks like an expensive antique, Carol. Well done! If you do more of them, I would do linen. Have you stitched anything on Aida lately? I've decided I've outgrown Aida. No offense to anyone who loves Aida. I just love the challenge of linen. By the way, love your new spring background and header photo! Ack! I forgot to thank you again for the cording-attaching tutorial. Thank you! What a great idea for your readers to have a chance to win your cording. I'm not going to enter, though, because I made some cording today and for the first time EVER managed to do it without swearing. :-) That's progress! Thank you so much for the cording instructions!! I'm still trying to perfect my cording skills-it seems to be too loose, but I guess is takes practice!! I do so enjoy reading your blog and appreciate all the finishing tips you share. I've been stitching a couple of the Lizzie Kate spring freebies, they are quick and I have a feeling of accomplishment. Please enter me in the cording giveaway. Thank you for your generosity!! Carol: Great post, I love my corder, it makes it so easy. Thank-you for all your links. Your Easter Stitch is beautiful I too would have changed the bunny colors. I have done a few Told In A Garden designs, I should dig the ones out I have not finished, I hate French knots. It will be snowing here soon 5-8 inch's predicted. No need to enter me, thank-you for the offer. Hi Carol...I love the heart of bunnies and eggs and your finish is wonderful. You have chosen one of my favorite fabrics green polka dot. It came out beautiful. Funny just the other day I found some old "Told in the garden" patterns that I had forgotten all about. I was thinking of stitching one. They are neat patterns that I think would be enjoyable to stitch. Thank you, thank you, thank you for the great tutorial on putting on cording. I really want to do that. And, I would LOVE to be in the drawing. I almost missed it as that horrible flu came back even worse the second time and knocked me for a loop. It took every single bit of energy out of me and I'm trying hard to get back to comments and a post from us. I have never had such a bad flu like this before. Carol, i tacchini! Che simpatici! I tuoi ricami sono meravigliosi e grazie per il tutorial, molto utile! Hi Carol - I am so sorry that I have been slow in getting my Comment written to you. I just love reading your blog and seeing what truly wonderful stitching and adventures you share with us- you never disappoint us! Your French Easter design is so charming and so adorable. I love it! The finish in the frame with the green polka dotted fabric is perfect - your creativity is perfect! My mom stitched “Blueberry Homecoming” from the Told in a Garden design series quite a while ago. In fact, it is hanging in her room now, so I see it quite frequently and love it. Your picture of the Amish buggy and the article about them is really interesting and fun to read - thanks for sharing that with us too. You do have quite a few Told In A Garden in your stash. They are so charming - I can fully understand why you added them to your collection. Plenty to keep you busy for a while. (ha! ha!). When I see the photo of some of your stash, it makes me think that I should go thru my stash and really assess what I have to stitch (and I know it’s a lot! I think it’s safe to say we are addicted to cross stitching!). I probably shouldn’t purchase anything new, but there is so much cute stuff out there . . . . . Thank you, too, for sharing all that great information about making cording. Your cording and your finishes are truly incredible! I really need to work on that project. I think you have inspired so many of us to keep working on that part of the project. When I first read about it in your blog post, I thought you could hold a class and so many of us would sign up and come! Wouldn’t that be fun? Beside learning about making cording, we could all meet!! I also loved the turkey pictures - they are really big, and so interesting to see them. I love that they can stop traffic! Too funny!! Well, I always write too much in my Comments but I truly want you to know how much I enjoy your postings. Thank you so much. Hope all is well with you and your family and that your mom is doing well, too. When do you go to visit her again? and I hope you are recovered from that cold and flu. Hi Carol, What a lovely post! Love your finished creations. Thank you so much for all the tips on finishing. Your finishes always are so creative and professional looking. I would love to be entered to win the cording. Thank you so much. I'm very late in commenting on this post since we've been unpacking for the last 3 weeks. However, I'm able to relax in my recliner this evening and get caught up on reading emails and blogs. After so many months of Autumn and Christmas needlework by everybody, it is truly refreshing to see the Spring Easter designs. Anything with bunnies and flowers gets my attention. Your stitching is always PERFECT!! Such a delight to see! And you do a great job with the cording, too! You really created a masterpiece with that old gold frame you transformed into something antique white! Thanks for sharing your stuff! I always enjoy seeing what you've been up to! What a pretty Easter finish - I do love these little chicks! Your dug-out finishes are very pretty as well, I hope you'll stitch up a few more of these in the future. Thanks for your little tutorial - cording is so pretty, but I'm terrible at using it. As such, I would love to be included in your little giveaway if it's not too late yet! I love your Chicks and Bunny piece so have spent hours searching on the computer trying to find the pattern. I did find it was part of a series in a magazine but never the name. I even looked on France's ebay without any luck. It is a beautiful piece. Carol, your heart finish is adorable. I have a thing for hearts in cross stitch designs and the colors in this piece are so soothing. Wow those Amish projects are gorgeous. I can't see the holes in the fabric, is it 50 or 60 count? Thank you for sharing the tutorial about cording, I wish I could do something like this. Welcome ~ I'm so glad you've dropped in for a visit! I love getting to know fellow cross stitchers from around the world, discovering new stitching blogs, and being inspired by your work. I hope you enjoy your visit today and thanks for taking the time to say "hello!"